I’m finally doing it. I’m in the midwest, on an enhanced risk day. I’m headed to Oklahoma City, which Mother Nature seems determined to slowly scrub off the face of the earth. I can’t lose. I’m really STORM CHASING. The news is going nuts. Moore closed their schools. I’m stoked. Not about the school part. I have a plan, the roads are good, my cameras are ready. I woke up this morning around 8:30, giving me about three and a half hours of sleep. I put the weather channel on for background noise for a little while and saw Jim Cantore interviewing a storm chaser and asking him what he thought was going to happen today. That feels a little backwards to me. I’d think the chaser would want to be talking to the trained meteorologist about what THEY thought was going to happen today. It’s very muggy today. I expected this to a degree, but I ended up a sweaty mess just carrying my bags to the car. It’s also really hazy, and this I did not expect. I figured that with all the convective energy present, things would be at least breezy up until showtime and that would make for great visibility. It’s the plains, right? We like it there because of the unobstructed views. Live and learn. Man I say that a lot. I headed towards Wichita, then past without a single stop. 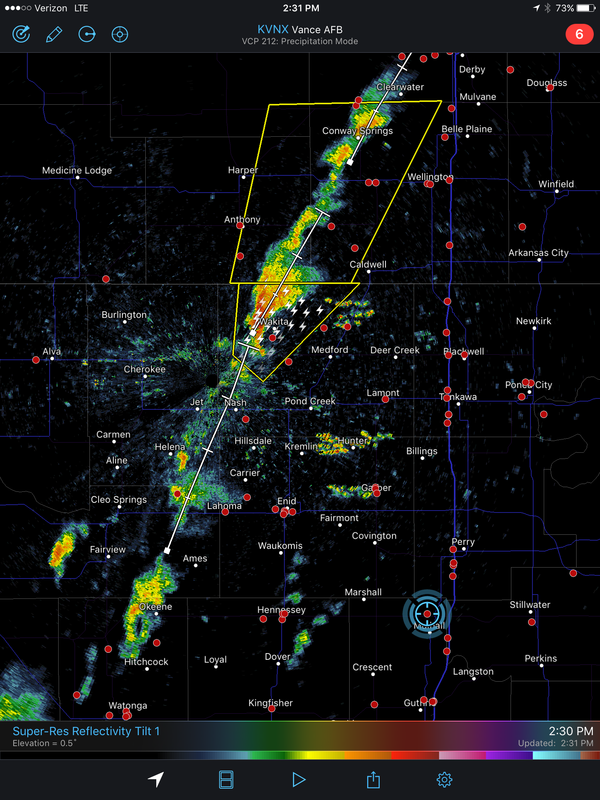 Highway 81 was closed in places in Wichita and I feel strangely better about my southern chase target because of this. I don’t want to hit construction if I need to escape. As I headed south on I-35, I stopped at a rest area for a quick bathroom break and started really looking at the roads and town sizes. Stillwater was looking more populated than I liked. I don’t want to get mired in towns with low speed limits and an abundance of other drivers. Things are looking to fire off further west, and I want to make sure I have road options, both for quick decisions and escape. I decided on Perry, OK, right next to I-35. I hit Perry around 1:00PM and ate, then watched the radar and the skies for awhile. Skies: still hazy. Radar: way more useful. I’ll just hang out here I guess. At about 1:30PM cells were going up about 25 miles west of my position, tracking through Watonga, Okeene, and continuing up through Enid. I was counting on them taking a more NE approach, but they’re moving single line NNE. I decided to head to Mulhall, then changed my mind after seeing the roads and headed further west to Marshall. I accidentally went into Marshall, noticed that there was a dead end, and bailed south and west to Hennessey. Then I stopped and used my new RainX stuff to clean my windows and coat them with water repellent. I found out that the bottle had leaked a little bit into the tote, and it was also not a cleaner at all. I’ve sealed the bugs to my windshield. They will be my friends forever. Remember folks, I’m a professional. 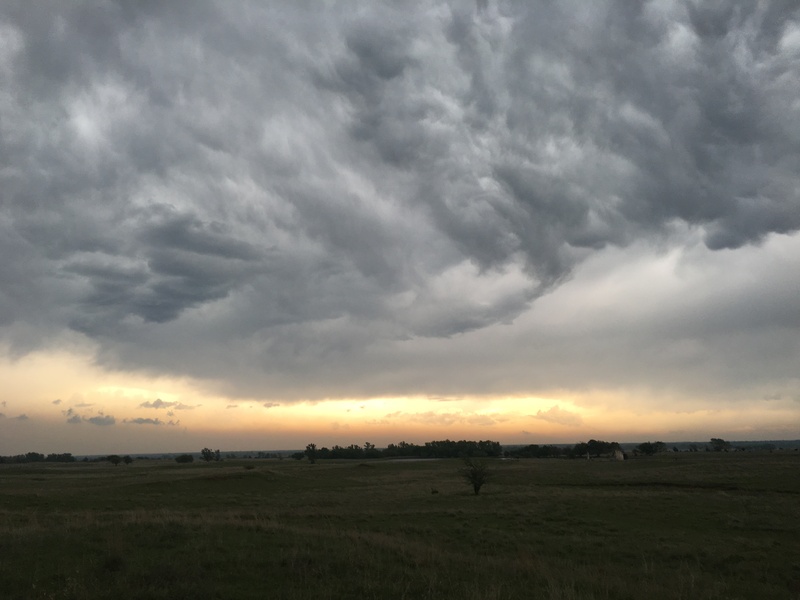 Around this time the first tornado warned storms were popping up…in southern Kansas. The same line of storms I was following would drift NNE over the border and almost immediately become tornado warned. I was initially dismayed, but it was still early; things would most likely change. I got into Hennessey around 2:30PM and now needed to make a choice. I could run north into Enid and try to catch the latest in the line of severe warned storms or continue west to Okeene. I opted to head north, and ran straight into downtown Enid. I had not realized Enid was so big; exactly the thing I worried about with Stillwater. Traffic slowed down and I decided that there was no way I was going to catch anything at this rate. I aborted and turned around, heading south back through Enid and Hennessey. I stopped in Hennessey to gas up and grab some caffeine to pick me up. I was starting to feel the lack of sleep. Once in Okeene, I continued north past Isabella, stopping along the way for some pictures. The haze was slowly clearing and I could now make out some of the structure of the closest supercell. Around this time it dawned on me that I was chasing way too far away from my targets. I resolved to move closer to the next storm, and continued north, past Ringwood and stopped just short of Helena. The storm I was chasing at that point had seemingly accelerated and was moving north faster than I could reasonably keep up. I was still gaining on it, but just barely. At this rate I’d be back into Kansas before I could actually get anything. It was a little after 5PM now and I decided to head back to Okeene and see what was up. Another chain of severe storms were rapidly moving NE from Witchita Falls and were aimed directly at Moore. These storms had been tornado warned earlier that afternoon. If I don’t move soon, I was going to enter Moore as they hit and plow into them. I’d be driving directly into the heavy precipitation. Then I glanced outside again, and this time really looked around. The haze was gone. Clouds were RACING towards me. I was right in the path of a beautiful gust front. 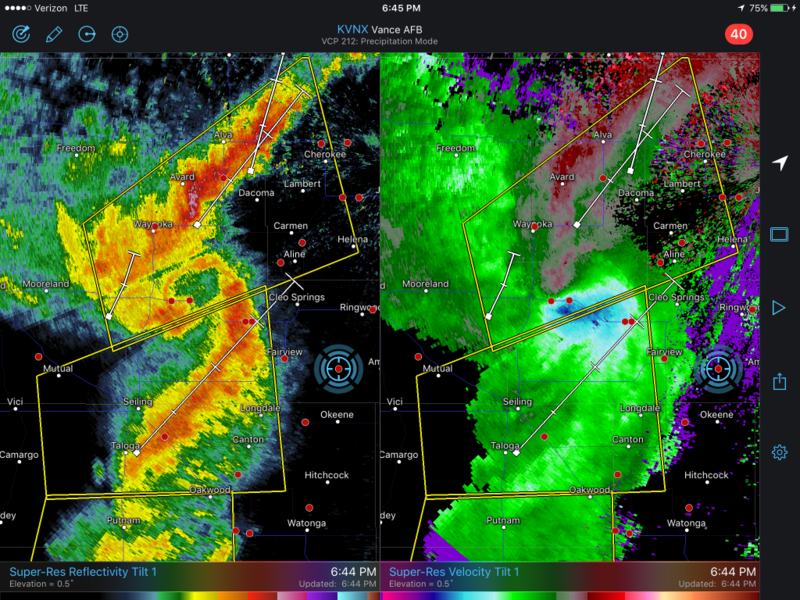 Just to my NE, the gust fronts of two cells had intertwined and in the middle of the confluence, doppler radar was reading wind speeds approaching 90mph. Told you I’d get closer. Based on current storm direction, I will miss the worst of the winds. The only indication of rotation on radar is NE of me, also moving NE. I have been chasing all damn day and have nothing to show for it. I’m staying. I’m glad I did. Sort of. I have video and pictures of the gust front sweeping right over me and past. The winds and lightning were incredible. At one point I opened my car door and was leaning against my car door frame, with the door sitting lightly on my back. A strong wind gust slammed the door on me so hard I couldn’t open it for a second. Wow. A little better, but it doesn’t do it justice. This…THIS is what I was here for, and the storms were so much stronger than what I’d experienced in Arizona. I knew this would be the case, but knowing and experiencing are two entirely different things. It turns out that this would be even more true than I thought. Shoot south back to Okeene. This puts me out of the path of one severe storm and into the path of the southern storm, which now appears to be weakening. The severe warning for it has expired, and a new one had not been issued. Maybe find somewhere to hole up in north OKC, preferably with an awning or roof. Let the storms overtake me since I’m pretty much out of places to run. Then when things dies down a little, head into Moore. This also lets the severe storm about to hit Moore from the SW go past. That storm looks very organized on radar, but is not tornado warned. A good plan, I thought. It was getting darker and that kills my photography options. I know I’m new to chasing, and the thought of chasing tornadoes at night does not appeal in the slightest. Step one went perfectly. Step two was even better. I got in some of a little rain from the non-severe storm at my back, cleared it, and turned onto route 74. Those severe storms SW of me were moving MUCH faster than I planned. I had not outrun them, just the one directly behind me. The one behind me was now severe warned again, and was headed right for me. There was no way I was going to escape south without plowing right into the approaching fronts. There was no shelter where I was located. So I decided to continue with my plan. Around Crescent, the wind picked up considerably. I continued on. At some point I stumbled into a section of road where apparently some sort of frog exodus was occurring. I saw around four dozen frogs all hopping across the street in the same direction. Weird. Kept going south. The winds increased again and now the rain hit, blasting the car and dropping visibility to almost nothing. High beams just made it worse with the amount of rain blowing sideways at me. It got worse and worse, then just SE of Cashion I decided to stop and let the main gust front pass. I pulled off onto the edge of a side road to let the worst get past me. I checked the radar but couldn’t get a current picture for a minute there. The car was rocking back and forth and the road was almost invisible now. I turned on my dashcam again to capture some of it, but the battery was almost dead and it quickly powered itself off. Earlier, I had opted to charge both my phone (for video/pictures) and my tablet (for radar) instead of the dashcam, since it had been pretty disappointing thus far. What sounded like hail started hitting the car. Crap. It doesn’t sound quite right though; it seems like it’s hitting the side of the car more than the top. I didn’t see any hail outside, but my visibility was crap. I decided after two really loud hits that I was going to lose some windows, so I grabbed everything electronic and shoved it into a plastic bag and tossed a blanket on it. Then the radar finally updated, and I realized what had just possibly happened. I could kick myself now for not getting a screenshot of it. The cell I was under was now tornado warned. Doppler radar showed a pretty clear velocity couplet about half a mile due east of me, moving ENE. The information bulletin didn’t confirm a tornado, but strongly suspected one. I’m about 75% sure that this velocity couplet went either straight over me, or right next to me. The things I felt hitting the car was most likely debris, not hail. Or maybe it was hail being shotgunned at the car. I may have been right next to a tornado. I never even saw it. This got me moving again. I checked the radar again and started heading south at best possible speed, which was about 35mph. The next hour is pretty much a jumble of high winds, heavy rain, and my GPS blissfully taking me right into a construction zone. All the cones and flags were blown over. Trying to figure out what was road and what might actually be the original coned off areas was fun. I made it to the house around 9:15PM. Tired, a little rattled, and nervous about what the car might look like. The car ended up looking ok. Maybe I wasn’t as close as I thought…? The haze that came with today’s chase screwed me up. I was spoiled by the previous day’s perfect visibility and assumed that I could chase at distance just like before. I was wrong. Identifying storm features was impossible unless you were right up next to the reflectivity signatures during the early hours of the event. (and then some!). Things changed around 5:30PM though, for the better…and worse. I’m going to have to be less timid. I screwed myself out of half my chase today by not committing to ANYTHING. I’d chase a storm, get close, then second guess myself. Or decide I didn’t want to get in that close. I became bolder much later in the day and when I did things got much better. Again, not fixating on my target helped out. I moved west to from my original target of Stillwater because I wanted to be on the other side of I35, then I adapted based on conditions. This seems self-evident, but I have a tendency to make a plan and then stick to it, sometimes a little doggedly. The big one: My desire to protect my car and to get to the location I was staying caused me to lose situational awareness. This could have ended very badly for me. As I write this, I’m still thinking about the “best” solution to this problem, save driving far, far east and hoping the storms weakened or died (They didn’t, by the way. They strengthened and later that evening actually produced some tornadoes near Tulsa.) I should have stayed put, watched what was happening, and reacted to what was around me, not headed south hoping for the best. I’m a bit ashamed of myself. I need a real video camera. The iPhone does pretty well, and I do want to try recording in 4k resolution next time I’m out, but the limited options make for varying degrees of video quality. I need a real DSLR or mirrorless camera, or I need to learn to use Heather’s Canon EOS 60D or simply drag her with me more often. Preferably both. I’ve been putting off the photography aspect of this process for too long now, favoring the meteorological parts more. I may need to invest in a good tripod later. The mini-tripod I bought is terrible when exposed to wind, though the magnetic feet and the bendable legs allow me to attach it to the side of my car and use the car as my windbreak. The Galaxy S5 as a dashcam does not work well. Or maybe I should say that the mount does not work well. Quality is ok, but low light is pretty bad and the mount shakes like crazy, even vibrating a little when idling (and I leave the car on all the time for safety reasons). Also, it’s nearly impossible to eliminate the suction cup out of the frame. The iPhone did…ok…when on the big tripod. I need to get the hell away from the car to film though, as well as precheck my light settings, lock my focus, and leave it pointed at the same thing when I want timelapse shots.